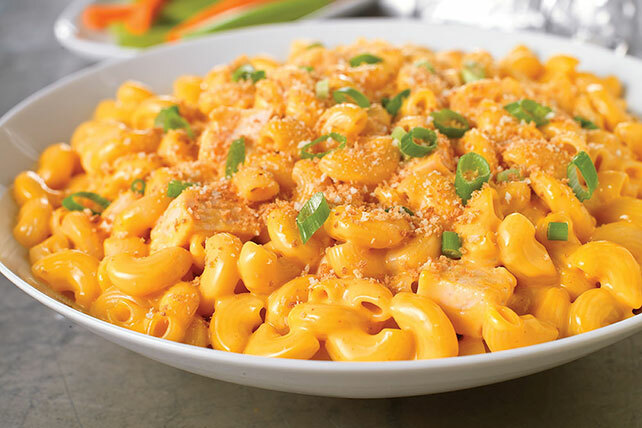 Add chicken to cheesy mac, then give it a shake of Buffalo wing sauce, and a favorite side becomes the main attraction at the family table. All in just 25 minutes. Cook Macaroni in large saucepan as directed on package; drain. Do not return macaroni to pan. Melt butter in same saucepan on medium heat. Whisk in flour; cook and stir 1 min. Gradually stir in milk; cook 1 to 2 min. or until thickened, stirring constantly. Add Cheese Sauce, chicken, wing sauce and macaroni; cook and stir 2 min. or until heated through. Sprinkle with onions and bread crumbs. Serve with a crisp mixed green salad tossed with your favorite KRAFT Lite Dressing.